Unique stylish lofts with an exceptional private terrace with Acropolis view! Where every stay is unique! Book directly with us and get the lowest possible price for your stay! 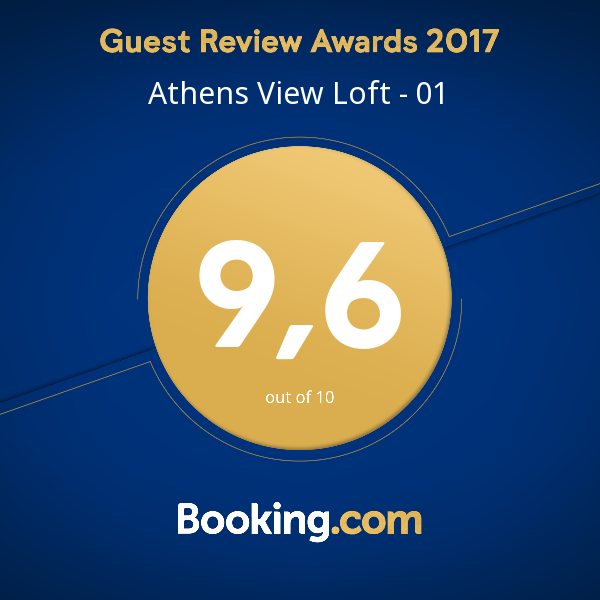 The Athens View Lofts share with their guests the best of Greece. Athens View Loft 06 - Un appartement vraiment parfait. Tout était parfait. La décoration est très minimaliste et vraiment très jolie, tout en noir, gris et blanc. Tous les équipements nécessaires sont présents dans toutes les pièces, de la cuisine à la salle de bain. Je reviendrai sûrement! Athens View Loft 04 - Perfect day This loft is in the perfect location! Walking distance from all the major attractions in Athens. The loft was clean, comfortable, affordable and had a beautiful outdoor area for sunset drinks. Konstantina and Chryssa were so kind and helpful arranging our stay and with any questions we had. They provided us with a super helpful map of local places they recommended to eat, see and shop. We are so grateful for their hospitality! Athens View Loft 03 - Everything was excellent. It was clean, quiet and I had everything I needed and more. The location is close to almost everything, you can easily walk to enjoy the sightseeings, to find great places to eat and to buy some souvenirs. Also, the host provided one of the best services, I had absolutely nothing to complain about and the money matched the conditions. I would highly recommend this place to anyone. Athens View Loft 01 - Overall amazing stay!! Amazing place, views and host!! Fantastic!! The whole place was AMAZING! Great apartment, close to centre, AMAZING Acropolis view and great host! Athens View Loft 01 - Super Kurzurlaub !! Wir hatten einen super Urlaub in Athen , es war alles bestens. Sehr sauberes Appartement und wirklich genauso schön wie auf den Fotos. Konstantina hat uns tolle Tipps gegeben und sich um alles gekümmert :)nochmals vielen Dank für den netten Service.100 % weiter zu empfehlen ! Athens View Loft 04 - Super Lage, total modern. Die Vermieterin war sehr freundlich und hat uns einige Tipps zu Athen und Umgebung gegeben. Das Zimmer wäre während unseres Aufenthalts auch gereinigt worden, das wollten wir aber nicht. Die Wohnung ist sehr modern eingerichtet und mit den wichtigsten Küchenaccessoires ausgestattet. Athens View Loft 04 - Excellent apartment Beautiful apartment with excellent patio area. 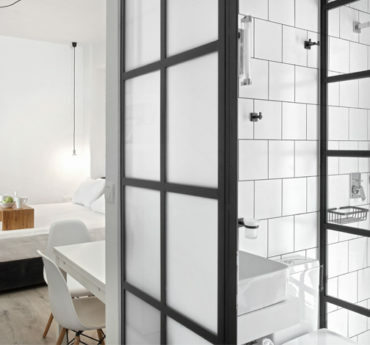 Very clean with anything you could want for a stay in Athens. Lovely local part of the city with views of the acropolis. Check in was so easy and the information provided was excellent as a starting point to our journey. Athens View Loft 03 - Fabulous!!! Clean, quiet, and beautiful. The outdoor terrace was fabulous and just as pictured in their pictures. Konstantina was gracious and waited for me when my arrival was delayed by a Metro strike. I would highly recommend this apartment. My only minor suggestion for improvement is that maybe the apartment could have shampoo and conditioner supplied. Athens View Lof 02 - Great location to explore Athens and great view The host, Konstantina, was very punctual and helpful at our arrival. The apt is state of the art, with good self-service breakfast. Great location with a view on the Partenone (a glass of wine on the terrace with the Partenone lit in the evening was a real treat!) and easy access to all sights on foot. Can't imagine a better place to stay in the centre of Athens! Athens View Loft 01 - Excellent host, modern and in every detail well designed appartment, big terrace with Akropolis view. 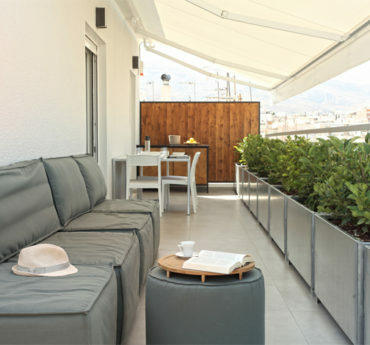 Athens View Loft 01 - A very comfortable, well designed and located apartment in Athens. A very comfortable, well designed and perfectly located apartment that suited us perfectly for our 2 night stay. Chryssa our host provided wonderful assistance and information, especially about great places to eat. The view of the Acropolis and Parthenon from the balcony is epic. Athens View Loft 06 - Άριστο! Πλήρως εξοπλισμένο δωμάτιο με καταπληκτικό πρωινό,άνετο κρεβάτι και τελεία θεα.Εντυπωσιακη η διακόσμηση! Athens View Loft 06 - Wir kommen wieder! Chryssa hat uns sehr freundlich empfangen und uns viele Tips gegeben, wie wir unseren Kurztrip am besten gestalten können. Das Loft ist sehr sauber und ist zentral gelegen. Die Terrasse ist ein Traum! Die Innenstadt ist in 10 Minuten zu erreichen. Ich werde sicherlich noch einmal nach Athen reisen und definitiv wieder bei Chryssa meine Unterkunft buchen! Athens View Loft 05 - Buena opción para una pareja. En general todo, tanto la dueña como la persona que nos entregó las llaves son muy amables, parada de bus muy cercana, el metro algo más lejos, pero en media hora caminando estás en el centro. Es una buena elección. Athens View Loft 04 - Just perfect! Lage, Ausstattung, die Besitzer, es gab einfach alles was man brauchte. Die Lage? Mein Traum. Sehr schönes Viertel und es hab kaum Touristen. Es war sooo sauber und es fehlte an nichts. Danke!!! Athens View Loft 04 - Great appartment Very clean and very optimized appartment. We also liked the furnished terrasse. The host was helpful and very friendly. We liked the neighborhood (not touristy, which for us is great, with restaurants, bars as well as supermarkets within walking distance). Athens View Loft 03 - Comfortable with beautiful View in a luxury apartment Amazing view, beautiful flat. Konstantina was super help full whenever we needed her, and went beyond to make our stay great. This is probably one of the best self-catering apartments in Athens. Best off all they had proper size wine glasses...you need proper size wine glasses!! Thank you Konstantina! Athens View Loft 06 - Super, fast schon perfekt! Das Loft ist hervorragend ausgestattet - der Kontakt zur Vermieterin unkompliziert und einfach nur toll. Es ist zu 100 % weiter zu empfehlen - wir kommen wieder! Athens View Loft 05 - The apartment was perfect for what I needed and Chryssa made me feel so at home when I arrived. The amenities were fantastic and was able to condense everything I needed in such a charming space. Very comforatble and very relaxing. Great value. Will definitely stay (if available) on my next trip to Athens. Athens View Loft 03 - I will come again! The room, the extra bed, the view to the Akropolis, the breakfast possibilities and the nice Hostess who tried to make all the wishes true! Everything important is in a walking distance! Mets is very calm and secure for living and also for walking at night. Very near is a typical tavern with nice and cheap food! Athens View Loft 06 - Best place to stay in Athens, amaizing view and tarazza:) The view and balcony was so good that you don`t wanted to leave the place! The Apartment was amaizing,clean, new, with everything what you need inside (coffe, salt, toster, towels, wasching Maschine, glasses). Owner was very nice and helpfull and always there if you need her. Athens View Loft 02 - Le paradis! The best place in Athens, extremely clean, well located and there est.Très extra people more than exceptional accueille.Konstatinas you a 10 alone. El mejor lugar en Atenas, muy limpio, bien situado y hay personas adicionales est.Très más de 10 excepcionales le accueille.Konstatinas solos. 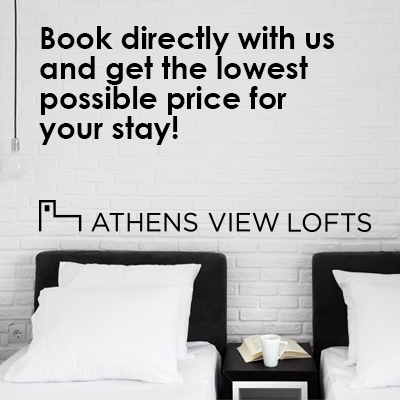 Athens View Loft 03 - Incredible stay!! Awesome location, wonderful view! I wish if we could've stayed longer than 2 nights at the loft.. The apartment is in a perfect condition and it offers what you need during your stay! 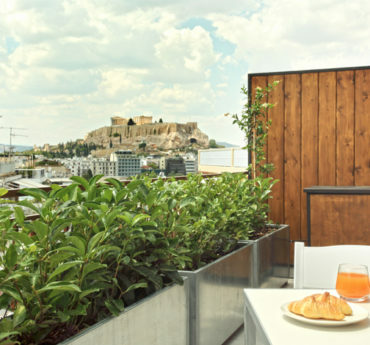 The terrace is spacious with a spectacular view of the Acropolis. Walking distance to Plaka, syntagma square and Acropolis! Konstantina is a sweetheart and she is very helpful!! I recommend you stay at the loft! Athens View Loft 05 - A wonderful cozy loft Everything was perfect! The loft is located in Pagkrati area, where you find everything you need and the transportation to all the spots of interest was very easy! The loft is modern, cosy, felt like home.. The terrace is wonderful! 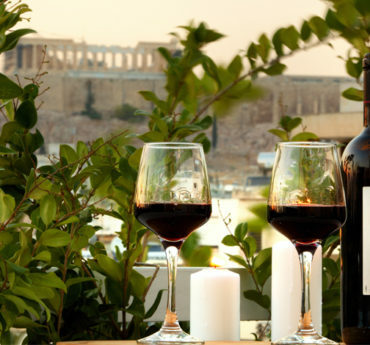 We sat every night enjoying the beautiful view of Athens and Acropolis! Many thanks to Konstantina who was super helpful and caring during our stay making sure we have everything we need! I recommend you stay at the loft! Athens View Loft 04 - Sehr zu empfehlen !!! Die Aussicht war einfach nur Traumhaft . Das Appartment liegt sehr Zentral und wir konnten alles erreichen . Die Aussicht auf Acropolis war jeden Abend ein Traum . Wir kommen gerne wieder vielen Dank für die schöne Zeit . Es gibt nicht s was uns nicht gefallen hat. Athens View Loft 03 - Great loft and great hostess! The loft was superb with luxurious design and touch. Our hostess was super helpful and caring, and kept in touch during our stay making sure we had all we needed. The area (Mets) might seem a bit far from the tourist center, but is a great neighborhood for bars, cafés, bakeries and restaurants. Athens View Lofts 02 - Great apartment! Everything was perfect. *Location - 7 min walk to Acropolis, metro station, acropolis museum and Plaka, tram station just in front of the entrance of the apartment. 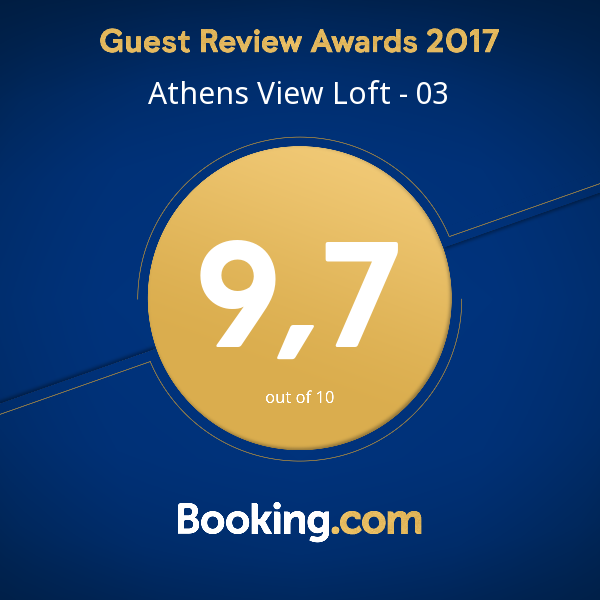 *Host - Kostantina is a great host - helpful, friendly and punctual and gave us useful tips *View - Parthenon panoramic view from the window and terrace is very impressive *The apartment - very cosy, stylish very clean and comfortable. Even if you want to find something to moan about, your really need to try hard... The view is amazing, the apartment is delightfully decorated and super clean, all you will find even more than you need. The person who is taking care of it is not only sweet, polite and friendly but also extremely helpful. I love staying in hotels, but this beats any city hotel experience I ever had in Athens ! Our host met us at the metro station and escorted us to our accomodation. The accomodation was a beautifully styled studio apartment with a great view of the Parthenon! The top floor balcony is the perfect place to enjoy a few drinks and watch the sunset in the evening. We enjoyed our stay and would recommend to anyone!